In August 2012, MarkWest hosted a meet and greet with the residents and officials of Harrison County, announcing their plans for Utica Shale development in eastern Ohio. 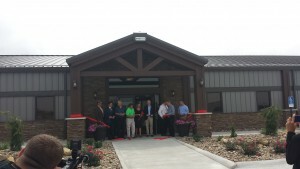 This week, the company continues to keep the promise it made three years ago, and as they cut the ribbon of a 20,000 square foot corporate office in Cadiz, Ohio. The event also served as a reminder that MarkWest has invested over $2.5 billion to date in Ohio, and is employing local residents in the community. Case-in-point: As evidence that MarkWest is committed to hiring local residents, the open house and ribbon cutting was kicked off by Office Administrator, Melissa “Missy” Yoho, a local resident of the area, and mother of 5, who stands with 110 permanent employees who will work out of the new corporate office. This commitment to hiring local employees is proof that MarkWest is putting Ohio back to work, creating jobs, and driving down unemployment in the state. The event is yet another milestone in the company’s impressive expansion in Ohio, which includes the Cadiz processing plant, where the company separates methane and ethane from a mixed stream of natural gas liquids and transports the products in separate pipelines. In Noble County, the Seneca processing plant was built, where MarkWest separates methane from a mixed stream of natural gas liquids, and in Hopedale, MarkWest built a fractionator where they separate the mixed stream of natural gas liquids into purity products, including butane, isobutane, propane and natural gasoline. In addition to the administrative and processing plant, Cadiz is also home to the Cadiz condensate stabilizer, which stabilizes condensate for shipment to purchasers of the product. Thanks to investments like these, the oil and gas industry is continuing to reduce unemploymentfor Ohio’s workers, boost county coffers by bringing in millions in tax receipts, and creating opportunities for millions of work hours yet to come.